Skip Gengras. Photo credit: J. Fiereck Photography. 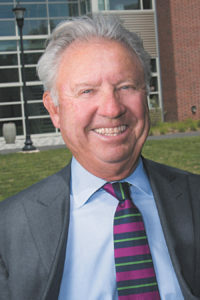 OLD SAYBROOK — Skip Gengras of Gengras Motor Cars of Old Saybrook, a member of the Greater Hartford community, was honored with a Lifetime Achievement Awards in recognition of his longtime contributions to business and community. Three other people were similarly honored. During the awards breakfast honorees participated in a panel discussion moderated by Richard Sugarman, President, Hartford Promise, during which they shared lessons, highlights and wisdom gleaned from their careers. The 2017 Lifetime Achievement Awards were presented by Hartford Business Journal with the support of Harvard Pilgrim Health Care (presenting sponsor); UConn School of Business (education leadership sponsor); and, The Pita Group (event sponsor). Event partners include: Bond Ballroom, Rider Productions, Merritt Graphics, J. Fiereck Photography, The Perfect Promotion and Co-Communications Marketing and Public Relations. Hartford Business Journal is the only audited weekly, subscription-based business publication in Connecticut. Whether it’s market trends, the latest merger news or an update on state government, this award-winning weekly is the “must read” for area business leaders. Hartford Business Journal has a total readership of 31,000 affluent and educated business decision makers in the 61 towns that make up Metro Hartford. For more information, visit www.hartfordbusiness.com or call 860.236.9998.